SPECIALIZED IN MARKETING DEVELOPMENT LAND IN THE FRASER VALLEY. Before we take a property to market, we’ve already identified the site's highest & best use and developed a clear & concise marketing strategy. 7402 + Lot 2 202A St.
"Joe Varing showed a huge amount of professionalism throughout the process of selling our property. He listened to our concerns and guided us every step of the way. We are more than happy with the services provided by Joe and his team and will highly recommend them to our friends and associates." "Working with Joe and his team was a pleasant experience, he suggested the best time and price to list , gave the updates on offers presented, followed through on all items discussed before, we give them a Five Star Rating"
"Land is a precious jewel, it must be handled with love and kindness. Joe Varing understands the law of the land. If one wants to have a conversation beyond the normal jargon, give this young man a call." "Relationship driven, results oriented. Joe Varing is persistent to say the least. His knowledge of land from the ground up is thought provoking and quite educational. He’s not 1 dimensional by any stretch of the imagination." "The expertise, honesty and integrity in conducting business with Joe and his team are second to none. One of the greatest benefits in working with Joe is that you have peace of mind knowing that your interests are looked after with the utmost care and attention." "Joe is a very unique individual, he’s goal driven, it’s obvious. When he approached us, he had done all his homework and knew exactly what we could attain both in terms of price and completion, not to mention the large Direct Deposit we received. We are thankful that we connected with Joe and his team, they are one of a kind. Keep selling Dirt!" "Joe and his team are simply the best, anyone looking to sell land should 1st consult with them. Honest, persistent and value relationships." "When we finally came to the decision to sell Joe Varing and his professional team made it an extremely easy process. We had certain goals we wanted to accomplish in this transaction and he was able to help us reach them. He communicated well with us through the process, answering questions with up to date information and always in a pleasant, non-pressured atmosphere. It was a pleasure!" " Mr. Varing and his team have performed in a most admirable way; respectful to the concerns of Vendor and Buyer alike; prompt, efficient and with a keen attention to details. The Varing team of professionals provide the full scope of guidance and assistance required in the purchasing or selling Land Development Properties. We give Joe Varing and his firm a Five Star Rating." E. F. Byskal & Associates Ltd.
"Joe helped us choose the right time to list the property. With his help we were able to secure a deal that benefited both buyer and seller. During the entire process, Joe was always immediately available to answer our questions. We recommend Joe Varing and Varing Marketing Group to anyone intending to buy or sell development property." " Joe made an excellent, well-researched presentation to our property committee. In subsequent meetings he gave us very good service in terms of making us aware of the process, developing a marketing plan and keeping us up to date on developments. His group followed through on the marketing plan. We had a positive result within the time frame we had set out and on terms very similar to our initial goals." "I have found Joe Varing to be hard-working, conscientious, and knowledgeable in the negotiations for the sale of my property. He took care to understand and address any concerns and questions, providing reliable, informed advice and assistance, all without undue pressure. I would not hesitate to recommend his services as a realtor." "With [Joe's] expertise and real estate contacts, he told us when it was a good time to list at the price we wanted. He gave updates on offers presented, followed through on all items discussed before we listed and met our target price. I find Joe easy to talk to and he showed concerns as to what we required from the sale. If you wish to sell your development property I would give him a good recommendation." 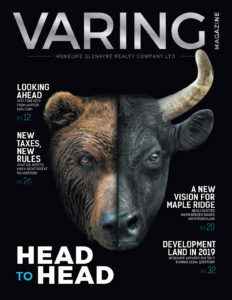 JOE VARING PERSONAL REAL ESTATE CORPORATION LTD. Send us your property's address and we'll share our thoughts.